► UGANDA: Government outlines its initial fleet requirements for Uganda Airlines 2.0. Kampala is moving ahead with plans to resurrect defunct national carrier, Uganda Airlines (QU), following reports that government has already outlined its intended fleet requirements for twelve aircraft needed to service regional and international routes. ► SOMALIA: (MEDIA) Air Uganda touches down in Mogadishu. Air Uganda (U7) on 8 July 2013, launched its 3x weekly service between Entebbe and Mogadishu, Somalia using a CRJ200. On hand to see in the arrival were Government officials from both Somalia and Uganda who welcomed the Air Uganda jet with the symbolic “water canon salute”. ► SOMALIA: Air Uganda to start Entebbe - Mogadishu from July 8. True to its word, Air Uganda (U7) will from 8 July 2013, launch its previously announced 3x weekly service between Entebbe and Mogadishu, Somalia using its recently delivered CRJ200 (MCN 7363 | 5X-UGH). ► SOMALIA: Air Uganda eyeing Mogadishu flights with third CRJ200. The newly appointed CEO of Air Uganda (U7), Cornwell Muleya, has set forth a bold new initiative by saying his company plans to use it's recently acquired Bombardier CRJ200 (MCN 7363 | 5X-UGH) to commence direct flights between Entebbe and the Somali capital, Mogadishu, later this year. ■ UGANDA: Cornwell Muleya appointed CEO of Air Uganda. Meridiana Africa Airlines (Uganda) Limited, also known as Air Uganda(U7), has announced the appointment of Cornwell Muleya to the position of CEO. He joins Air Uganda from Kenyan outfit ALS - Aircraft Leasing Services (K4), where he has been CEO for the last 3 years. An Engineer and Chartered Accountant by trade, Mr Muleya spent the early part of his career in audit and financial consulting with Deloitte and PriceWaterHouseCoopers. ► UGANDA: Air Uganda announces changes to Juba, Dar es Salaam ops effective 1 May. In continuation to our previous post, Air Uganda (U7) has updated its schedule with changes to Entebbe - Dar es Salaam, Entebbe - Juba (South Sudan) routes coming into effect from 01MAY. ►► TANZANIA: Air Uganda planning for Entebbe - Kilimanjaro flights; launches "Crane Class" product. [UPDATE 2 APRIL] Air Uganda (U7) has revealed that it is in the process of planning a new route from its hub in Entebbe to the Tanzanian tourist mecca of Kilimanjaro. Currently, the airline operates to the Tanzanian capital, Dar es Salaam. ■ UGANDA: Air Uganda renews its IOSA certificate; launches new Premium Economy class product. Celestair's Air Uganda (U7) has passed its IATA Operational Safety Audit (IOSA) and has had its certificate renewed until 30 September 2013 according to the International Air Transport Association (IATA) website. The certificate was awarded to Meridiana Africa Airlines Uganda Ltd t/a Air Uganda. ● UGANDA: Golden Jubilee Airshow set for Entebbe from 15-16 December. Uganda’s Civil Aviation Authority, together with Air Uganda, Eagle Air and the Kampala Aeroclub amongst others, are working together to put on the Golden Jubilee Airshow to be held on the 15th and 16th of December 2012 at Entebbe International Airport. The airshow is being held on the occasion of Uganda's 50th Anniversary of Independence, gained from Britain in 1962. ► RWANDA: Air Uganda introduces extra Saturday flight to Kigali. Air Uganda (U7) have announced an increase in their Entebbe, Uganda - Kigali, Rwanda flights effective immediately. The Bombardier CRJ-200ER operated flights will now fly daily with the addition of an extra Saturday frequency. ► UGANDA: Air Uganda to get rid of its last two MD87s. In a move that will see it left with a fleet of two Bombardier CRJ-200s, Ugandan carrier Air Uganda (U7) has decided to retire its ageing fleet of McDonnell Douglas MD87s "later this year", according to Swiss aviation site CH-Aviation. Having started out with three of the ex-Iberia aircraft, Air Uganda has subsequently retired 1 from the fleet leaving two which it uses, in addition to its two CRJ-200s, to focus on its regional network consisting of Bujumbura, Nairobi, Mombasa, Kigali, Juba, Dar es Salaam, Zanzibar all served out of its Entebbe hub. ► UGANDA: Air Uganda ups frequencies to Kigali, Bujumbura, Mombasa; shows strong growth. Ugandan national carrier, Air Uganda (U7), has announced an increase in flight frequencies between Kigali-Entebbe-Kigali to twice daily every Monday, Wednesday and Friday. The other days will remain at once daily service according to their Facebook page. 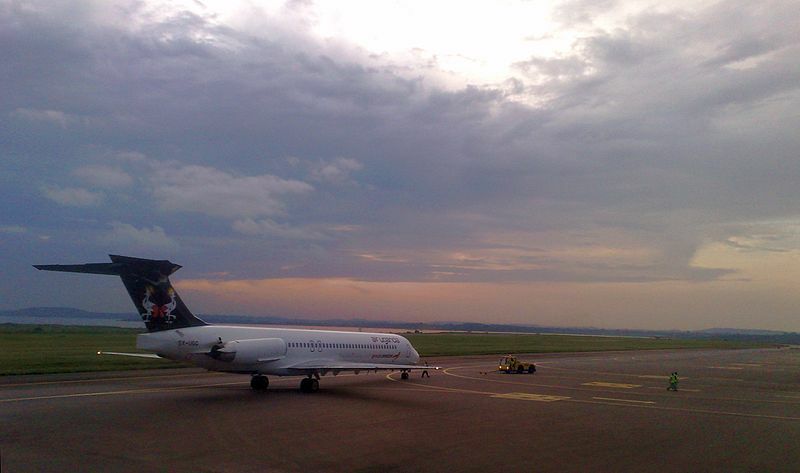 Bujumbura has moved from three flights to four times a week. Entebbe-Mombasa-Entebbe will also see an increase in frequency to five times weekly from Tuesday to Friday and Sunday to cater for the growing demand on the route. Figures released show a substantial growth of 39% in passenger numbers on the route in the last quarter of this year, attributed to increased trade between Kenya and Uganda, with the Mombasa port being a key entry point for goods within the East Africa region. Also in the pipeline is service to Kisumu, Kenya, which is still under consideration by the Kenyan authorities.